MobileHelp provides three medical alert systems: Duo, Classic and Solo. Each system includes features like cellular and GPS tracking, wrist buttons, and a MobileHelp Connect smartphone app. MobileHelp offers the simplicity of a home medical monitoring service with the added flexibility and empowerment of a cellular phone for active seniors who want more out of life. MobileHelp is a medical alert and service provider out of Boca Raton, FL that has been in business for nine years. MobileHelp offers a medical alerts system that notifies your doctor, neighbor or relative if you suffer an emergency that requires immediate medical attention. Monthly service plans are available with no contract and include discounts when purchasing a year at a time. It is one of the first companies to offer cellular coverage for seniors on the go. Alert coverage is available through the AT&T mobile network. Home service includes a basic, affordable set up with a station base. MobileHelp is one of the most straightforward companies to work with for medical alert service protection both in and out of the home. Base stations, wearable emergency devices and accessories arrive at your home within a week with simple, do-it-yourself installation. There is no need to pay for a technician or allow anyone into your home to set it up. No landline is required to use the in-home station or the mobile devices. Working off of cellular service, MobileHelp handles everything, so customers don’t have to open a cell phone account or sign any service contract with a mobile provider. Additionally, MobileHelp won our award for Best Technology on our comprehensive medical alert systems guide about the best medical alert systems on the market. 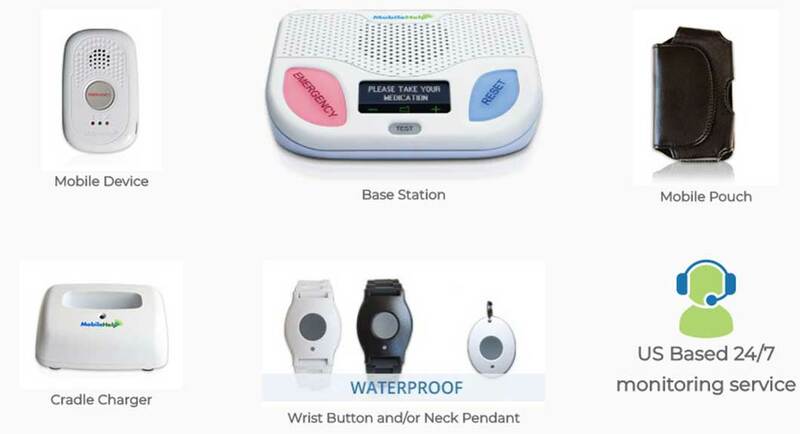 The home unit works with a pendant or wristband worn by the customer, and with cellular service to alert the MobileHelp team when customers push a distress button or the fall detector recognizes a hazard. With a range of 600 feet between the pendants and the base, most customers will find complete coverage in their home and much of their yard. If you opt for either the Solo or Duo plans, you’ll get access to their sizeable cellular network outside of the home with GPS accuracy that lets loved ones know your location in the event of an emergency. What Makes MobileHelp Stand Out? With the addition of medication reminders, it’s possible to have a complete health monitoring system at the touch of a button that also makes it possible for family, friends, and caregivers to participate in assisting the customer. Seniors can have as much or as little involvement from their support team as they are comfortable with, and MobileHelp is designed to adapt as needs change. Their products combine the best of both worlds for those looking for a traditional in-home monitoring system as well as a cellular phone-like device that can be taken anywhere. This type of customization cannot be found anywhere else on the market currently. Additional accessory plans are always available for purchase. These include the fall buttons for $10/mo, and the wall mount buttons, which are useful for placing in high-risk places in the home, such as the shower area, for a $2 monthly fee. MobilHelp also sells car chargers and fashionable lanyards on their website. There is no cost to purchase or rent equipment for customers with an active service plan. These range from $22.95 – $41.95 a month with a discount if you choose an annual payment. Beyond the cost of your plan, there is no additional service contract or commitment. MobileHelp offers three systems: Classic System, Solo System and the Duo System. All systems include both a waterproof wrist button that resembles a watch and a pendant customers can clip on or wear like a necklace. Each system also includes a monitoring service, two-way voice functionality, and their MobileHelp Connect® service. Add a Fall Button starting at $10 a month. You do not need to have landline service for any of the systems or service plans. *Annual plans offer significant savings over monthly plans and usually include at least one or two free months of service with full prepayment. Customers may also choose quarterly or semi-annual plans. The Classic System, the most affordable, lets users connect a stationary base to cellular service provided by MobileHelp. It is the best choice for those who are mostly homebound and don’t need the peace of mind that comes with the Mobile GPS coverage other systems offer. For those who share a home with a loved one or have help at home and don’t need in-home monitoring, the Solo System is a good value. It will send alerts while the wearer is away from home. The Solo System can also provide at-home security, as long as the cellular network coverage is adequate inside the home. Minimal setup and charging time is needed to get started, and it’s plug-and-play ready for customers who have even the most basic technical knowledge. For the most comprehensive coverage, we recommend the Duo System for active customers who want the combined security of a monitoring system and the freedom to feel protected anywhere mobile phone service is available. With this system, the wearer can get whole-house coverage, the convenience of medication reminders, and an easy-to-wear device that can alert loved ones to falls, even while outside of the home. Those who are frequently on the road or have a greater range of mobility will benefit from the Duo System because it can incorporate the home network and mobile GPS unit at any time. MobileHelp owns the equipment supplied to customers, so if your equipment malfunctions, they will send you a replacement. They offer a 30-day money-back guarantee to try the equipment to ensure satisfaction with no obligation. You’re responsible for lost or damaged equipment. Connect Premium helps you save money in the event your equipment is lost or damaged. It’s an optional service for an additional $5 a month. Customers who purchase this option can get their equipment replaced after a low-cost deductible instead of having to pay out of pocket for equipment costs or repairs. MobileHelp’s customer team works in partnership with Rapid Response and is available 24 hours a day to respond to issues in as little as 17 seconds. Rapid Response’s highly-trained team members work with both medical alert companies and home security companies out of their state-of-the-art facilities in New York and California. Rapid Response received the CSAA Central Station of the year award in 2016 and is certified by Underwriters Laboratories as compliant with the strict rules required to monitor NYC fire systems. MobileHelp also uses live chat on their website to quickly answer any technical or customer service questions that come up, or if you just need clarification on a product. With an A+ Rating from the Better Business Bureau, MobileHelp has earned a reputation for having some of the best customer service in the industry. Customers are pleased with the variety of options for wearables, which blend in by looking like other tech devices on the market. The company has also received high praise for its adaptability in a changing medical device market. As customers need different options for service, they make it easy to upgrade, add-on or change plans and equipment to give seniors just what they need. How often do I need to charge my MobileHelp equipment? Once you have charged your system and all the accessories, the neck pendant and wrist button can go five years or more on a charge. If you opt for a plan with a Mobile Device, charge it every 24 hours. The battery on the base station can last 30 hours or more. How long will it take to get help in an emergency? You will be connected immediately to a customer help team at MobileHelp as soon as you activate your device by pushing the button or when the fall detector picks up your movement. The time it takes for your local emergency services to arrive will vary. Note that your system can be set up to notify relatives as well when the call button is activated, giving you one more source of assistance when needed. Each accessory runs on battery power, with the battery life listed above. Keep the base station plugged into a power outlet and, if you lose power, the battery will kick in. The 30-hour battery feature will run for a little over a day without access to power. Why is MobileHelp better than a cell phone? Many of the same customers who would benefit from a home medical alert system may not want or need all of the features offered by today’s cell phone providers. The MobileHelp system can easily incorporate the perks of a cell phone (mobility, location tracking, security on the road) without the need for a separate cell phone plan or purchasing a phone. It’s also a no-contract way to provide safety away from home. Can I wear my MobileHelp accessories in the shower? The wrist buttons, neck pendants, and Fall Buttons are all waterproof and are safe to wear during basic bathing and showering. They are not recommended for long-term underwater activities, such as in the pool or ocean. The base station, wall buttons, and mobile device are not waterproof. MobileHelp was the first brand to incorporate a cellular network into their home safety and monitoring systems to give consumers the ability to get medical help and feel safe wherever they go. 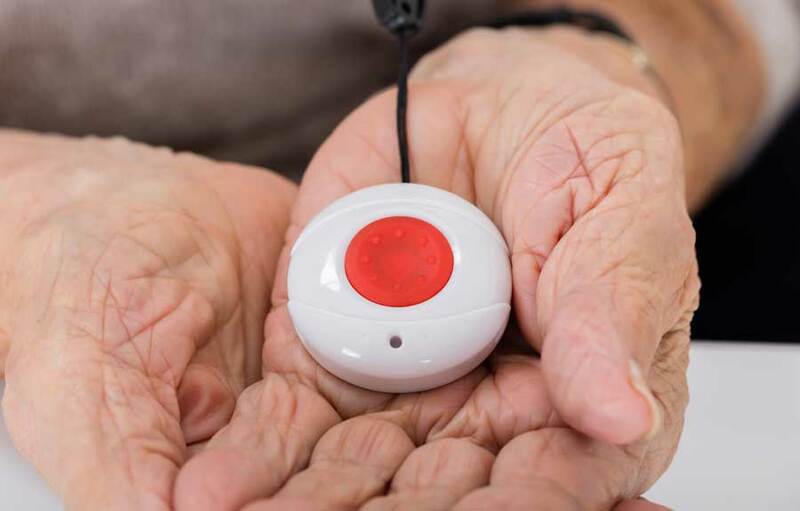 With many seniors unwilling or unable to add a cell phone to their daily routine, it makes sense to go with a system that incorporates this technology into an easy-to-use medical alert product that’s simple to set up and requires almost no maintenance. With today’s seniors being active outside the home much longer, MobileHelp offers safety, security, and independence for all ages. If you’re interested in MobileHelp services call 888-675-3231 or check out their online order form.